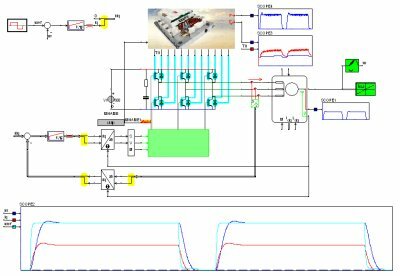 When modeling wind power and solar systems, detailed power electronics converters are key: the control of the generator takes place via power electronics, and the calculation of losses of the power electronics has to be modeled in detail. The modulation principle has a strong impact on the generation of harmonics on the grid side. In hybrid and electrical vehicle simulations, a virtual driver allows testing a model against a given time-speed characteristic. Once the inverter components are modeled in detail (including the loss calculation), the thermal behavior of the power electronics can be studied in detail. The virtual driver controls the field-oriented controller which, by using space vector modulation, oversees the power electronics inverter. The semiconductor models in CASPOC are directly coupled to a thermal model, meaning that during the simulation the parameter dependency on junction and heat-sink temperature are taken into account. During the simulation, the thermal cycling is calculated, allowing the estimation of life time. CASPOC includes special blocks for modeling space vector modulation. This is required since the harmonics generated by this type of modulation influence both the losses in the power electronics and electrical machine, as well as the dynamic behavior of the electrical machine.